But the doubles star also believes the SA Davis Cup were up against it before a ball was served due to conditions being tailored for Portugal. Doubles veteran Raven Klaasen admitted the national tennis team had struggled in the conditions at the weekend after they were handed a crushing 4-0 defeat in their Davis Cup relegation tie against Portugal in Lisbon. The South African squad dropped to Group 2 of the Euro-Africa division in the international team competition for the 2019 season, while Portugal retained their place in Group 1. “The court certainly was prepared well by the Portuguese to suit their games and with the capacity crowd behind them, it made it tough,” Klaasen said. The South Africans were completely outplayed from the start last Friday, as the host team displayed total dominance on the slower clay surface, with Pedro Sousa beating Lloyd Harris 6-1, 6-1 in the opening singles rubber and Joao Sousa outclassing Nik Scholtz 6-3, 6-2. 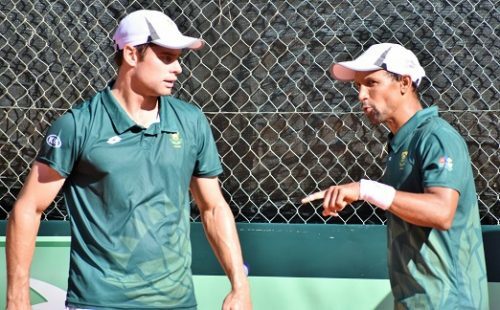 Portugal secured victory in the Group 1 tie on Saturday, with Joao Sousa and Gastao Elias handing powerful SA duo of Klaasen and Ruan Roelofse a rare 6-4, 6-7, 6-2 defeat in the doubles rubber. Later on Saturday, in a dead rubber singles contest, Joao Domingues beat teenager Philip Henning 6-4, 6-0. “I am still trying to understand where we went wrong” said SA captain Marcos Ondruska. While the hosts were the favourites on paper, Ondruska insisted his team had entered the tie with a real opportunity. Despite the confidence they carried into the contest, however, the SA squad were unable to put up much of a fight. “It was always going to be a tall order to beat them, especially away, but I did feel we had a chance and that the South Africans played well enough to win,” Ondruska said.